Founded in 1980, P&H Motorcycles has grown from a garden shed business to one of the largest motorcycle ‘destinations’ in the South of England. 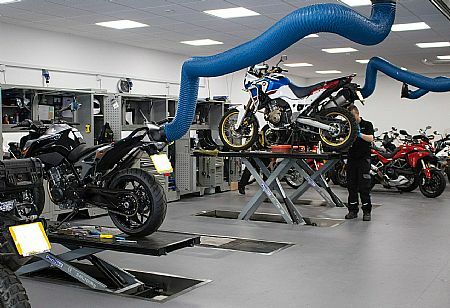 Operating from a 28,000sq/ft facility in Crawley, the growth of the business has recently noted the extension and refurbishment of its motorcycle service and repair department. In refurbishing and enlarging the new service facility from 3,000 to 4,000sq/ft, P&H Motorcycles instigated new methodologies and a transition in working procedures to streamline its operation and improve the working environment for its staff. A central element to this refurbishment was the installation of fume extraction equipment from Nederman. The busy service and repair centre has 14 workstations and prior to the refurbishment; P&H was using self retracting hose-reel vehicle fume extraction systems. However, the previous system had limitations that were identified by P&H Motorcycles Founder & Managing Director, Mr Paul Searle. 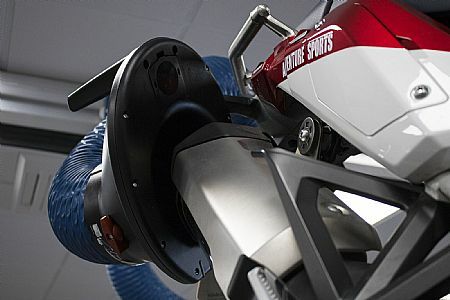 In the first instance, the previous self retracting system would see vehicle technicians stretch the 100mm diameter retractable hoses to the motorcycle exhausts, creating a potential trip hazard. This hazard could only be overcome by installing a self retracting reel for each individual station. Secondly, the previous retracting reel configuration required a variety of specialist nozzles to be fitted to the hose-end for each and every service to ensure the extraction nozzle would cover the vehicle exhaust and deliver efficient and safe extraction. The solution suggested by Nederman was an overhead ALU150 rail with a high-volume extraction system that sits above two rows of technician bays. Hanging from the rail are four 4m self-supporting extraction arms that have rigid and lightweight internal aluminium joints. 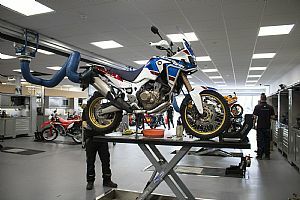 The lightweight joints can be lowered to a bike and pushed above head height with ease, avoiding trip hazards and keeping with the state-of-the-art aesthetics of the new facility. The four arms can slide along the 20m long ceiling mounted rail to the relevant technician bay and once in position, a neoprene seal on the rail will lock the position of the arm whilst in operation. During operation, each arm will generate an extraction flow rate of 200 to 250 cubic metres per hour. The ALU150 rail and the four arms are connected to a powerful high-volume centrifugal fan that extracts fume via ducting in the suspended ceiling and out of the building.